This quick tutorial will show you how to create a Desktop shortcut that when double-clicked will open your web browser and take you directly to a “New Document” in Google Docs. 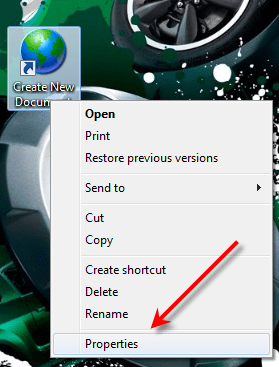 To create Google Docs shortcut, right click on desktop and go to New -> Shortcut. Now, paste one of the following URLs (see list below) in the Type the location of the item: box. Then click Next to continue. Give the shortcut a name and click Finish. Now your newly created shortcut will appear on your Desktop. Open the Web Document tab. There you will be able to see a shortcut field where you can type any shortcut you want to use. We’re not quite done yet as we still have change the icon to the shortcut (a little personalization is always nice!). To change the icon of the shortcut, right-click the icon and select Properties again. Go to the Web Document tab and click the Change Icon… button. Select the icon and click OK.
That’s it – you’re done! You can create multiple shortcuts this way so you can quickly open a new Doc file, Spreadsheet file etc.